The villas have been designed to offer only the best in luxury, comfort and modern design. Each villa is developed around large expanses of glass windows, sliding and folding glass doors to seamlessly connect the indoor and outdoor areas. The villas have tailored gardens and terraces with private pools and water features. Each bedroom with en-suite bathroom, modern kitchens with pantry, porcelain floors, wall tiles and much more. The developer is building twelve exclusive design villas with private pools only a short walk from the beach. The residential concept is a gated community with three and four bedroom modern luxury design villas. The SkyPlus villas have four bedrooms, with two spacious en suite bedrooms on the main level, a large master suite and a further en suite bedroom on the upper level. As with all villas in the BlueSky Riviera development this villa is designed to integrate the indoor areas seamlessly with the outdoor terrace and and patio areas - creating large open living spaces. Each villa includes an exclusive 32m2 private pool. The SkyPlus villas comprise a centrally placed lift with access directly from the double garage to the main and upper levels. All villas are euipped with airconditioning to ensure comfortable air quality and temperatures all year around. This SkyEasyliving villa is designed in a two unit configuration. The master suite is located together with the kitchen, dining and living areas in the main unit. The second unit comprises the guest house with two further ensuite bedrooms and a large living area. SkyEasyliving villa 2 is designed for single floor living. You enter the villa from the double carport. The master bedroom suite is located together with the kitchen, dining, living, terrace and pool areas on one floor. A guest section is located one floor down and comprises two further ensuite bedrooms, a spacious living area with an exotic tropical garden and a private patio. SkyEasyliving villa 3 & 4 are beautifully designed and laid out bungalow type villas where all you need for smooth living is located on one floor. The master bedroom suite is located together with the kitchen, dining, living, terrace and pool areas on one floor. A guest section is located one floor down and comprises two further ensuite bedrooms, a spacious living area with an exotic enclosed tropical garden and a private patio. SkyEasyliving villa 5 is beautifully designed and laid out bungalow type villa where all you need for smooth living is located on one floor. The master bedroom suite is located together with the kitchen, dining, living, terrace and pool areas on one floor. A guest section is located one floor down and comprises two further ensuite bedrooms, a spacious living area with a spectacular enclosed tropical garden and a private patio. The SkyHigh villas have three bedrooms with one spacious en suite bedroom on the main level, a large master suite and a further en suite bedroom on the upper level. The SkyHigh villas comprise large roof terrace with space for jacuzzi or splashpool and a large outdoor kitchen and dining area. 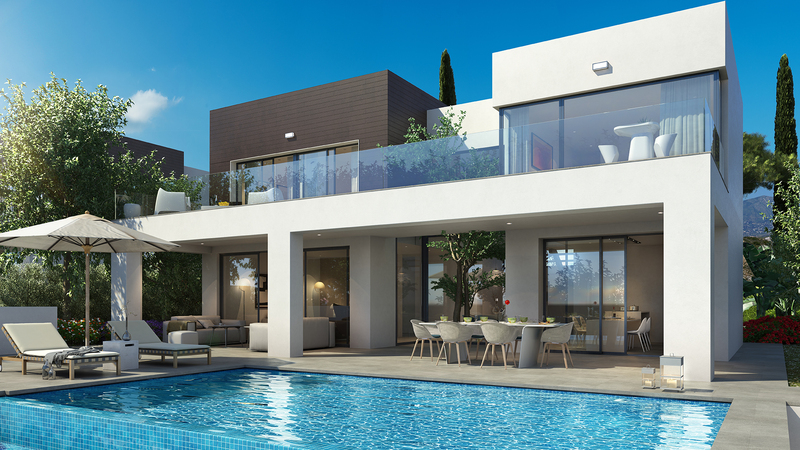 As with all villas in the BlueSky Riviera development this villa is designed to integrate the indoor areas seamlessly with the outdoor terrace and and patio areas - creating large open living spaces. Equipped with airconditioning to ensure comfortable air quality and temperatures all year around. Each villa includes an exclusive 26m2 private pool. All villas are equipped with airconditioning to ensure comfortable air quality and temperatures all year around.